A convenient location and a cozy, welcoming atmosphere are just a couple features you’ll enjoy during your Gatlinburg getaway at Alpine Serenity. 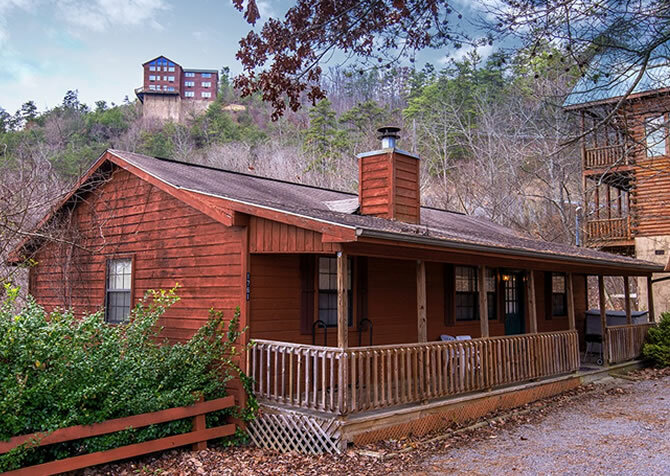 This lovely 2-bedroom, 2-bath cabin, nestled in the Chalet Village of Gatlinburg, boasts a 2-mile drive to downtown and room for up to 6 guests. Choose this cabin for your family’s annual vacation to Gatlinburg, a couples’ getaway in the fall, or a small group retreat with friends. Some entertaining amenities you’ll have to look forward to include a big screen TV, complete with a DVD player and a pool table in the loft. And with this cabin’s easy access to Gatlinburg, you can add to your entertainment possibilities a trip to Ripley’s Aquarium of the Smokies or Ober Gatlinburg, both of which are Cabins for YOU partners. * On the deck of Alpine Serenity, enjoy a semi-private atmosphere with wooded views that peek out to the Smokies. Soak in these sights from an outdoor patio set, an outdoor hot tub, or multiple deck chairs. 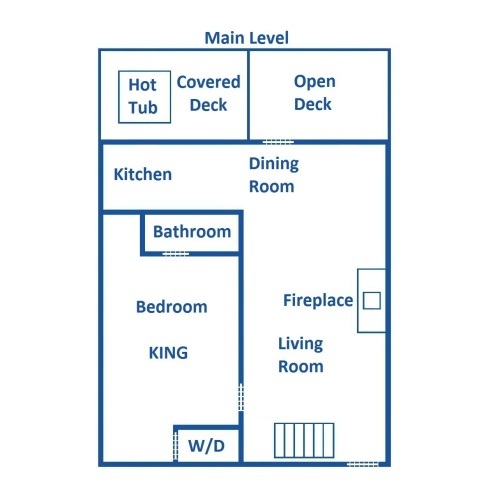 With all this and much more, you’ll feel right at home with your 6-person group during your stay at Alpine Serenity! The Alpine Serenity living room features high ceilings, carpeted floors, and an impressive stone fireplace that reaches all the way to the ceiling. When it’s time to rest your legs after a full day of hiking in the Great Smoky Mountains National Park (which is conveniently located less than 4 miles from Alpine Serenity), kick back on this cabin’s full-size couch or comfy armchair. From there, you’ll have perfect viewing access to the big screen TV found in this space. Watch a favorite DVD or VHS tape using the provided amenities inside Alpine Serenity, or pull out your laptop and surf the web using this cabin’s wireless internet during your stay. In late fall or winter, the wood-burning fireplace in the Alpine Serenity living room will be the perfect addition on a cool mountain night. And any time of year, feel free to clear off the coffee table for a family board game or deck of cards. Whatever says relaxation and fun to you, you can make it happen at Alpine Serenity! One of the conveniences of our Gatlinburg cabins is that almost all of them come with fully equipped kitchens. Alpine Serenity is no exception, offering a nice-sized kitchen with light cabinets, a coordinating laminate counter, and recessed lighting overhead. Enjoy all your major appliances inside this kitchen as well as a few countertop additions, including a coffeemaker, blender, and toaster. While delicious breakfast places like Crockett’s Breakfast Camp and Pancake Pantry can be conveniently accessed by Alpine Serenity, you’ll love the chance to relax in your PJs while enjoy fresh pancakes straight from the stove. And don’t miss the gas grill provided by Alpine Serenity! Fourth of July barbecues, homemade meals with the family, holiday dinners, picnic lunches—all of these can easily be prepped, cooked, and enjoyed at this Gatlinburg cabin. At Alpine Serenity, you’ll find sleeping accommodations for up to 6 guests, and in this cabin’s dining room, you’ll find a dining table with place settings for the whole group. This glass-top, rattan, and wicker–style table is just the place you’ll want to gather together for delicious homemade meals, laid-back lunches, or snacks on game day. 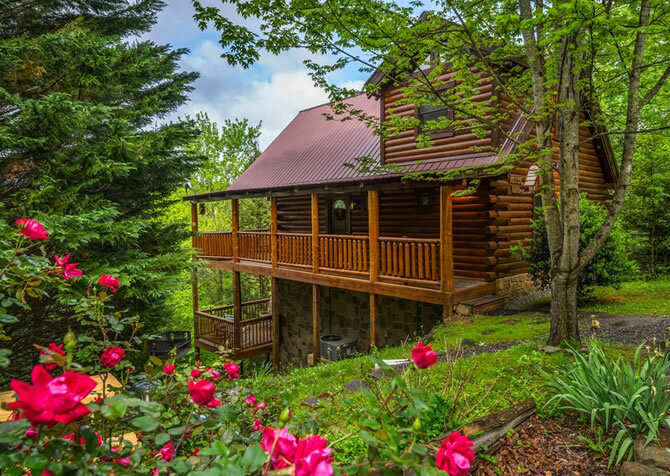 Conveniently, this Gatlinburg cabin also offers 2 stools at the nearby breakfast bar, providing separate seating for the kids or a cozy place to sip your coffee in the mornings. 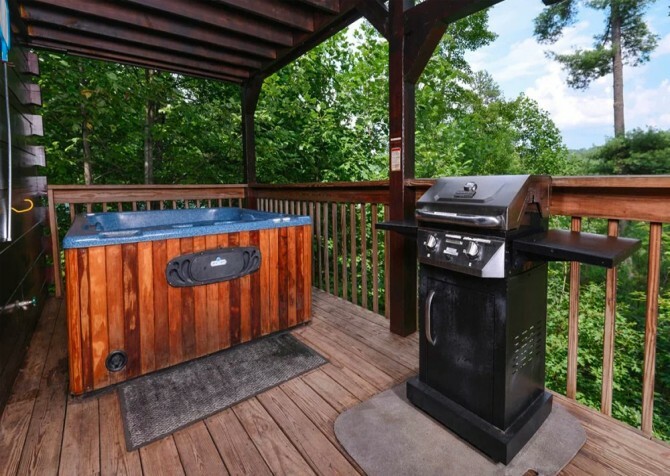 On the deck, you’ll find a 3-piece patio set that overlooks the Smoky Mountain trees. The variety of dining options allow you to enjoy your meals and each other’s company wherever you’ll be most comfortable inside Alpine Serenity. Although downtown Gatlinburg is only 2 miles from Alpine Serenity, playtime doesn’t have to mean getting in the car and finding an attraction on the Parkway. At this small group cabin, all you really have to do is walk up the stairs! That’s because the loft of Alpine Serenity comes with a full-size pool table where you’ll have hours of fun hosting family pool tournaments or teaching pool to the kids. 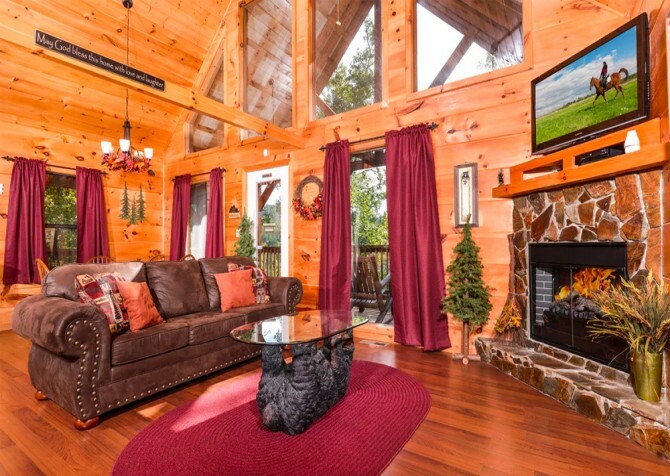 With large windows that overlook the Smoky Mountain trees, a ceiling fan overhead, and warm, carpeted floors, Alpine Serenity’s loft will be a favorite room for rainy afternoons or summer days when you need a break from the heat. Kick off your shoes, get comfortable, and enjoy hours of indoor fun inside this space. With 2 bedrooms and 2 bathrooms, Alpine Serenity will comfortably accommodate up to 6 guests during your Gatlinburg stay. That can be a single family or a small group of friends. 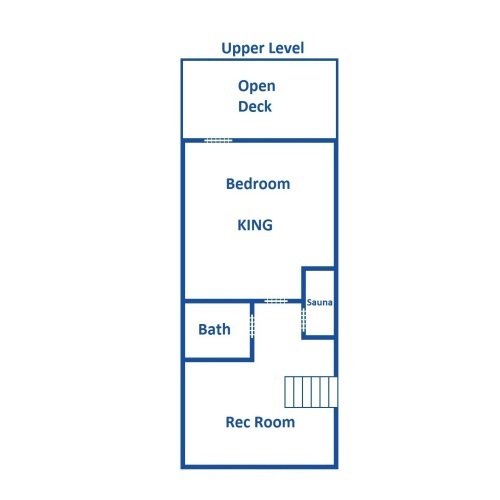 Either way, you’ll have access to 2 bedrooms—one on the main level and one on the upper level—and a queen-size sleeper in the living room. Both bedrooms offer traditional wood furnishings, king-size beds, reading lamps, nightstands, ceiling fans, and individual TV sets. You’ll also enjoy several windows, which let in natural light from the Smokies. Additional features unique to one bedroom are direct porch access and a comfy chair. The other bedroom offers an en-suite bathroom and a padded bench. Enjoy all these comfortable sleeping spaces during your stay at Alpine Serenity. A quick 2-mile drive to Gatlinburg doesn’t mean Alpine Serenity will keep you from enjoying the serenity of the Smoky Mountain trees. When you sit on the back porch, soak in your outdoor hot tub, or eat a meal on your outdoor dining table, you’ll enjoy the calming mountain atmosphere provided by this semi-private cabin. Other outdoor amenities include a gas grill, a wooden bench, and a wooden picnic table around the front. Feel free to pack a picnic lunch and drive to the nearby Great Smoky Mountains National Park, but at Alpine Serenity, this certainly isn’t your only option. You’ll have your very own private picnic locale with the shade of old-growth trees overhead. And when you’re done eating, grab a football or a Frisbee and spend some time playing in the fresh mountain air. At Alpine Serenity, you’ll enjoy peaceful outdoor spaces just as much its cozy interior! Along with an outdoor hot tub on the back porch, Alpine Serenity offers access to an indoor jetted tub—great for relieving stress or soaking sore muscles. Other convenient amenities included by this cabin are free long distance, a CD player, access to a washer and dryer, and a flat driveway where you can play outdoor games between shopping the Parkway and spending time at the national park. Everything provided by Alpine Serenity is meant to make you feel right at home during your getaway to Gatlinburg. A great place for families, this all-inclusive attraction features mini golf, laser tag, bumper cars, and a 3D theater. See the Guinness World Records book come to life at this huge attraction with more than 20 interactive games. A must-see attraction, come play arcade games and grab an Ogle Dog at this Gatlinburg landmark. "The place was very clean and located right in the woods! Had such a nice vibe to the interior and exterior. The interior was very cozy with a lot of carpeted floors and a nice open family room. This was exactly the kind of place we were looking for while staying in the Smoky Mountains! The pool table and hot tub were really nice touches and got some good use after we finished our day hikes. The location of the cabin was perfect as it was a 5 minute drive…"
"The place was very clean and located right in the woods! Had such a nice vibe to the interior and exterior. The interior was very cozy with a lot of carpeted floors and a nice open family room. This was exactly the kind of place we were looking for while staying in the Smoky Mountains! The pool table and hot tub were really nice touches and got some good use after we finished our day hikes. The location of the cabin was perfect as it was a 5 minute drive from town. But, fair warning, getting to the cabin can be a bit scary as the drive is up a steep grade. The road is a bit narrow and winding. This is nothing against the cabin though. Overall a fantastic stay! We would definitely come back."